“The shield may be as important for victory, as the sword or spear,” Charles Darwin wrote in On the Origin of Species, and with interior design client needs changing, designers may find more success rethinking their shields over drawing their swords against change. Two years ago, scientists at the University of Liverpool cracked an almost-200-year-old case when they identified the exact gene mutation that caused the peppered-colored moths living near 19th-century industrial towns in England to turn a shade of black. The shift in color from mostly peppered to mostly black — which occurred because soot from the factories covered the trees, turning them from an ashy white to black, and made the peppered moths more visible to predators than the black ones — is one of the most famous case studies in evolutionary theory, and this discovery allowed scientists to pinpoint almost the exact year that this mutation first hatched in a moth to be 1819. Twenty-nine years later, that mutation became an adaptation and guaranteed the moths’ survival in the new industrial world. When the interior design industry looks back on its history, the year 2018 will likely be known as the year of the first appearance of the black moth, or rather, the first year designers started acknowledging the black moth. At seminars, panels and town-hall meetings during the spring and fall editions of High Point Market as well as the Interior Design Society’s conference in May, designers started speaking more openly than in recent memory about the challenges of working with today’s consumer, which signaled to our publication that an evolution was taking place. 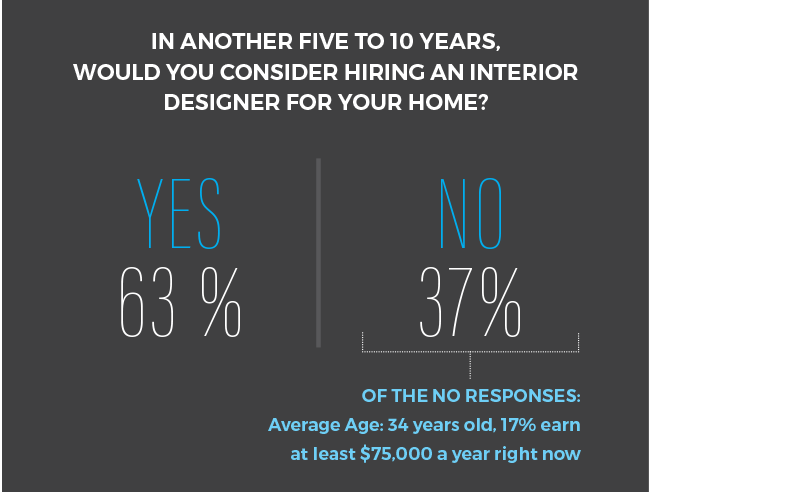 For our consumer research on interior design, we focused on whether or not consumers planned to hire an interior designer — now or in another five to 10 years — where they go to for design advice and what gave them pause when deciding to hire a designer. Turns out, consumers haven’t at all evolved past designers, which is great news. A solid 45 percent of respondents said they would hire an interior designer now, and 63 percent said they planned to in another five to 10 years. The average age of respondents was 34 years old, so these numbers should be encouraging. Most consumers seem to feel confident that they will be in a good place financially to invest in a designer. But work still remains. 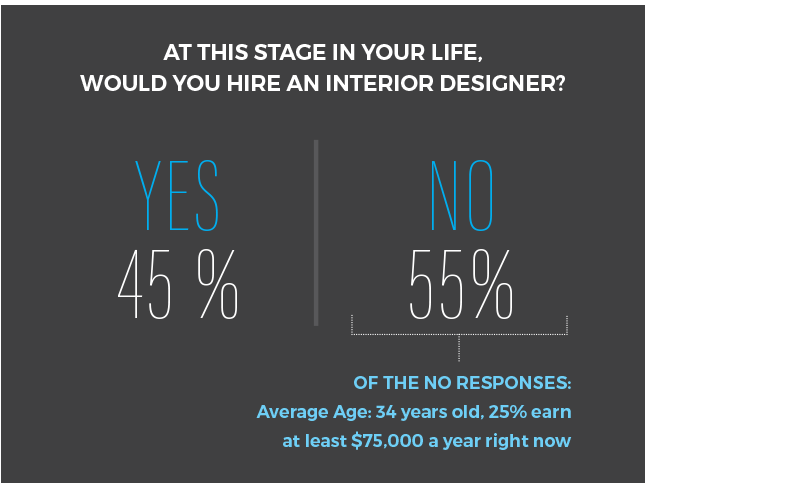 When asked for which reasons they would likely not hire a designer, just about half of the respondents said they can’t afford the service. Of that half, 25 percent of them make $75,000 or more, meaning they could hire a designer right now. Now more than ever, consumers of all ages and income levels feel empowered to take on their own home design projects, but interior designers shouldn’t resign themselves to the endangered species list just yet. So much opportunity awaits those who see this evolution taking place and adapt their business models rather than fight the change. Neither Jenny Cano, Executive Director for the Interior Design Society, nor interior design business consultant Julia Molloy was surprised by these findings. “We’re one of the few industries where pricing is so widespread,” Cano says. “It all depends on where you live and who you hire.” She adds that most designers don’t want a standard for the industry, but that they could benefit from being more open and accessible. Traditionally, interior designers represented the gatekeepers of good design, determining what it meant and guarding the pathway to it. Clients came to designers not only for their great style, but also for their exclusive access to top-quality and to-the-trade-only brands. Then, as Molloy sees it, the Great Recession broke through that model, and in order to survive, many wholesale brands opened themselves up to retailers and direct-to-consumer models. In 2008, 74 percent of U.S. adults were already online, according to Pew Research Center, and today, 77 percent go online at least once a day. Twenty-six percent of them say they’re online “almost constantly.” With this widespread adoption of the internet came the democratization of good design, access to resources such as Architectural Digest from anywhere in the world and the ease of online shopping. The internet gave consumers access to design and products when and wherever they wanted it, but it also pulled back the curtain on what design can cost at different levels of quality and price and how consumers can save a little with some time and elbow grease. 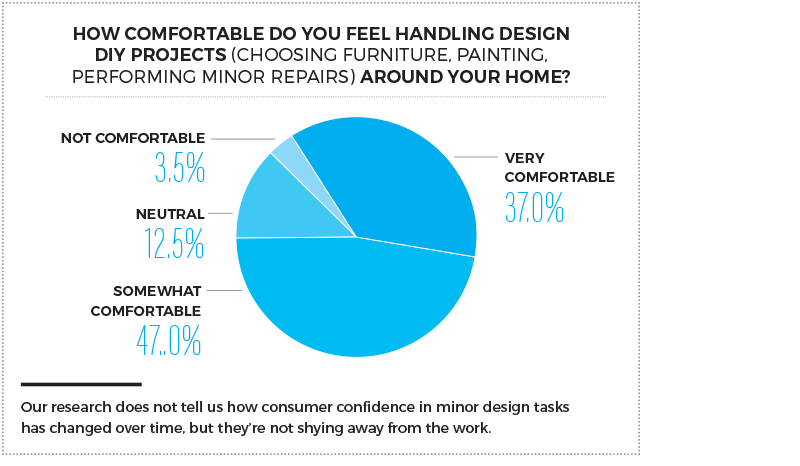 In our research, we saw evidence of this transformation when we asked consumers how comfortable they felt handling design DIY projects (choosing furniture, painting, performing minor repairs) around their homes, and almost 84 percent were at the very least somewhat comfortable. Of those making $75,000 or more? Almost 81 percent were either somewhat or very comfortable. Regardless of income level, consumers feel capable to do work around the house themselves. And when they need help, they’re going to YouTube and search engines like Google. 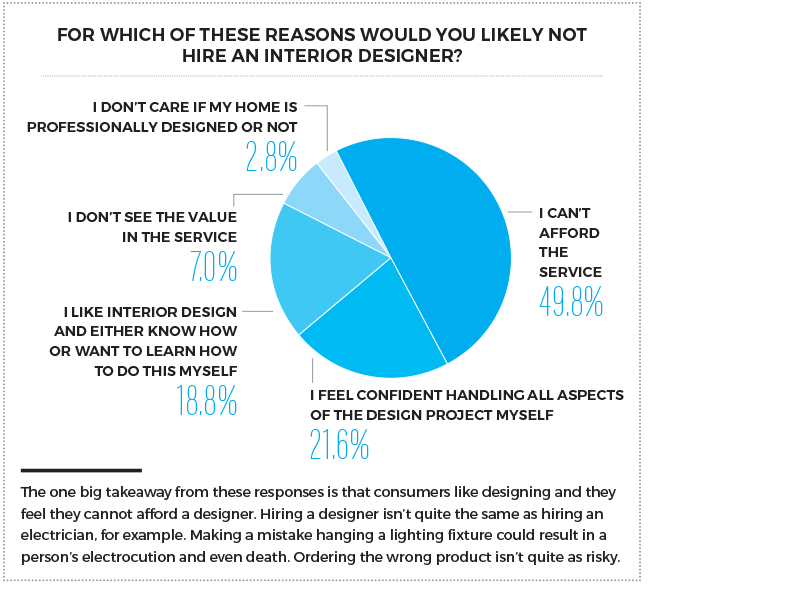 Only 6 percent said they would go to an interior designer for help when they run into a problem designing their homes. Being capable of home design is one thing, however. It’s another to have the time to do it, and that’s where Molloy sees an in for interior designers, a new way of doing business that eliminates the frustrations that occur when clients shop around their designers. In her work, Molloy’s noticed a hollowing out of the middle ground where consumers who would usually hire a designer are instead opting for DIY projects and better deals on furniture and decor. On the other side, clients that can afford luxury go all out, and there’s little left in the middle. Both ends offer plenty of opportunities; designers first need to decide which types of clients they want to court. “Both are totally viable. There’s no wrong answer,” Molloy says, adding that McDonald’s has survived decades because it knows exactly who it serves and, for the most part, tries to stay in that lane. It’s just a matter of choosing what’s right for the business model and tailoring it to meet the actual needs of those consumers. So then what does interior design look like for the DIY, bargain-hunting client who likes to shop for the best price and needs to balance it with quality? A concierge service, says Molloy. In her mind, a design concierge service is more of a one-time service than an ongoing relationship. There are different ways to structure it, but essentially, a designer offers his or her time in blocks for clients, maybe two- or four-hour blocks. When a client books a block of time, the designer visits the space — in-person or digitally — goes over what the client needs, makes suggestions and even shops with the client on a tablet. At the end of the session, the designer sends the shopping list to the client, and he or she leaves. It will then be up to the client to order all, some or none of the products and install them as the designer directed. Forget the whole purchasing process, Molloy says, just don’t do it. As our research shows, consumers feel confident and even like doing their own interior design projects, so let them do it. What they need from a designer is a good eye for how to put a room together, an expert opinion on color, finish and fabric and someone to help them move past shopping paralysis — another new internet phenomenon in which consumers have too many choices and become too frustrated to make a purchase at all. 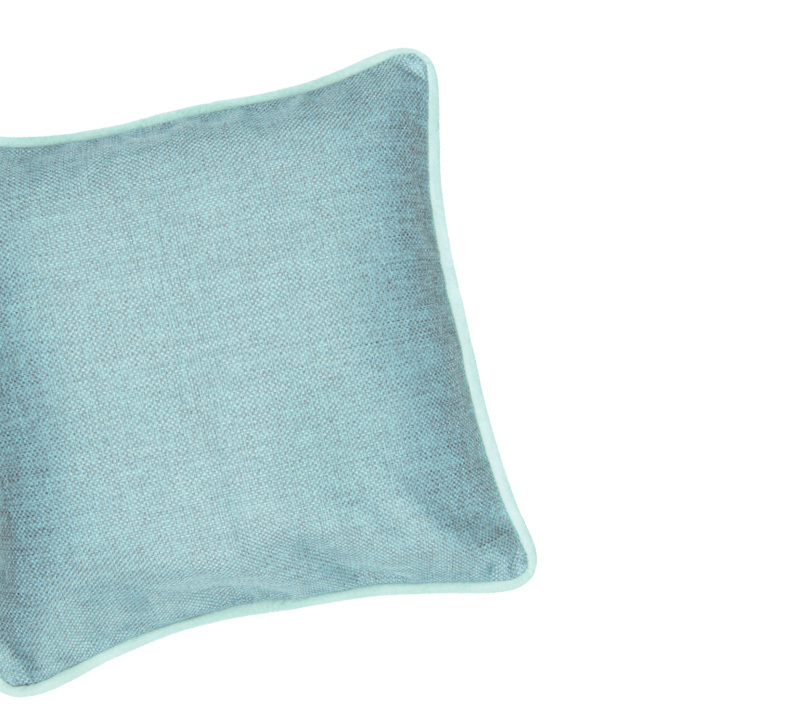 For the DIY-ers, the bargain shoppers, the would-be designers, Molloy believes a design concierge service offers more of what consumers today really want and alleviates the frustration designers feel when their clients shop around them. Cano has already seen this concierge service starting to catch on. She says it’s become popular in Texas, specifically Dallas, and in North Carolina, where her office is located, the business model is gaining traction as well. She’s also seeing great success among designers who offer a ladder of services, starting with simple, one-off services like helping a client pick out a paint color and moving up to full design services. Though some designers feel the pressure to go the luxury route because “that’s where the money is,” says Molloy, it’s not the best route, and there are other equally profitable ways of operating a design business — even for the DIY crowd. But if a designer does want to do luxury design, both Cano and Molloy agree: go all out. The moths from that famous English case study in evolution — be they peppered or black — never went extinct. Those moths in the countryside, away from the pollution, survived with their peppered colorings, and the black-colored ones near the factories lived on as well. Each color flourished in their environments. So too will interior designers that see their environments changing and adapt to fit them. 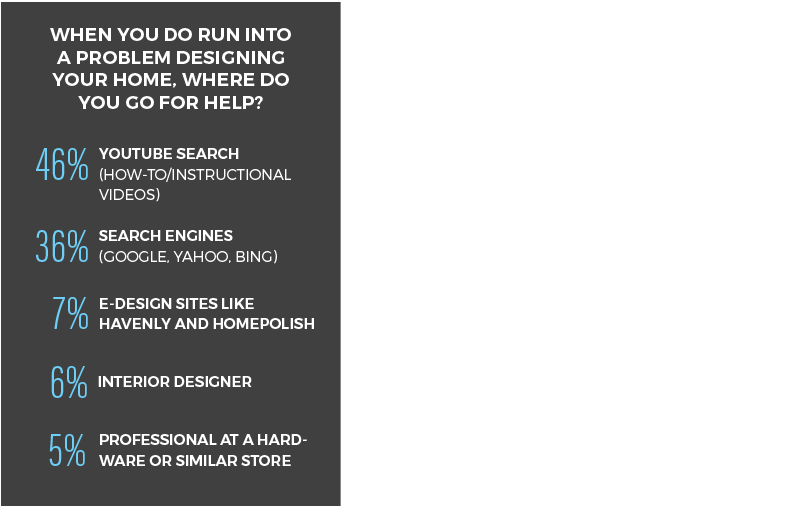 Our research found that most consumers go to YouTube when looking for design help (see above), but Instagram has long been the favorite social media platform of interior designers. It’s easy to see why. With Instagram, all designers need to do is take a photo with their phones, caption it and rake in the views. YouTube requires a working knowledge of video editing and shooting as well as editing software to make it all look pretty. YouTube is the second most popular search engine, next to Google. Google owns YouTube, and as our research found, search engines in general were the second go-to for consumers looking for design advice. YouTube has staying power. Over the last year, Facebook has weathered some serious criticism, and that’s bad news for Instagram because it is owned by Facebook. If Facebook goes the way of Myspace, so will Instagram most likely. Google may have had some negative press this year as well, but in terms of company strength, Google beats Facebook every time.